Media.net affiliate ad network is owned by yahoo and bing. Media.net is considered as the second most paying PPC ad network, it is also the best alternative to Google Adsense. If you were rejected or disapproved by Google Adsense then you should give Media.net a try. It is hard to get approved by Media.net same as Google Adsense and Buysellads. But Advance legal tips that will help you get quick approval in media.net even with low Alexa ranking of your website. Traffic is the main and important source of online income and for fast media.net approval, you must have 500+ unique daily traffic on your website or blog. The design of the website should be simple, clear, visible and easy to navigate. Your blog should also be mobile friendly, fast-loading, responsive, easy to scroll and avoid adding widgets with pop-ups. Without original and quality content a website is nothing that’s why all PPC ads network on the internet mostly focused on the content of your website/blog. To get approved by Media.net I suggest you write 10 article with 900+ words on the front page of your website/blog. 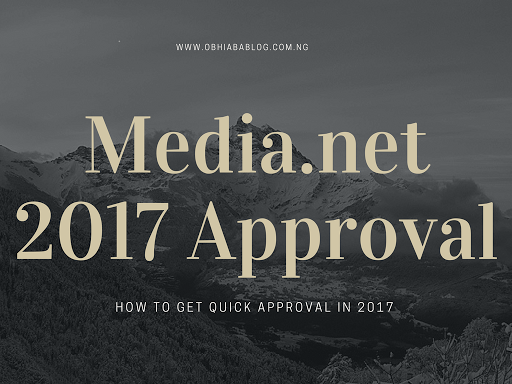 This will help you get approval by media.net very fast. You can’t get approved by media.net with a free hosted domain (blogspot.com, wordpress.com etc) because they mostly reject the application of a website which is managed on free hosted pages. You must buy a TLD custom domain before applying for media.net. High daily pageviews is a highly recommended policy of media.net and also the majority of your blog traffic must be from High CPC Countries Such as Canada, in the UK, and the USA. So, In this case, try to bring traffic from these countries using SEO and social media sharing. The language of your website or blog should be primarily English. Because Media.net mostly accept those website applications which are primarily in the English Language. If you are using dual language I suggest you the first few pages of your website should be in English especially your blog homepage, about, policy and privacy pages. If you think that we helped you by this tutorial then please don’t forget to share this article on social media. And let me know if have any confusion on about media.net approval in the comment section. I Am A Web Developer and Professional Blogger. I Teach WordPress And Blogger To Beginners On WBT. Great Effort Jalil.Nice see this awesome helpful post. Media net is the only way to go after disapproval by adsense.Thanks for sharing such a nice post. i will follow your tips . Hello! Jalil This post is very helpful.I am also following your WBT for a long time.I just love to read your articles.After your article about adsense approval fast on wbt I just got approval.Now with these tips I believe that I will get approval on Media.net also..Thank you Jalil.And thank you jhon for your blog I am going to check your blog article also. Welcome... Jalil has covered the important policies of getting approved and if followed, be sure of getting approved quickly. Hello! Javid thank you so much for appreciating my article. Thank you My Sky Tricks.Keep visiting this blog. Hello! Kulwant Dear Most Welcome and Thank so much for your love. Good Job very useful tips Jalil.Nice to see your friend blog.Hi Prince John Okosun Thank you for the helpful blog. Welcome Baloch. Am glad you like my blog. Thanks for sharing this awesome helpful tips. Hi! Thanks for appreciating my Post. Hello! Most Welcome Mujeeb Keep Visiting Obhiabablog Blog. Pls Mr obhiaba i bought a custom domain from guaranntor....I was able to set it up. But i can't visit my blog without putting (www. )in my URL. It is because you did not set it properly. Hello Jalil, am so much impressed by your posts here. indeed Media.net is really among the best advertising network. Thanks for sharing!